A New York-style cheesecake is decadently rich in taste!! 1kg cream cheese, at room temperature. Grated zest of one lime. Pulse the tennis biscuits till they resemble crumbs. Melt the margarine and slowly drizzle into the blender as you pulse. Keep pulsing till the mixture is well combined. Pour the mixture into a 20cm springform round cake tin. Lightly brush the inside sides of the pans with some melted margarine. Pour the cream cheese into the bowl of your stand mixer, using the paddle attachment beat on high until light and fluffy. Add 250g x castor sugar a little at a time and beat till everything is well combined. Add the vanilla essence, lemon zest, and cornstarch and beat again till well combined. Add one egg at a time and beat on low speed between each egg. Beat in the egg yolk an mix on a low speed. Add half of the sour cream and beat on low speed till everything is well combined. Pour this mixture over the cooled biscuit base. Pop into a preheated oven and bake at 200 degrees for 10 minutes, before lowering the heat to 100 degrees and baking for a further 30 minutes. Turn off the oven and leave the cheesecake in the oven for an hour. Crack open the door a little and leave the cheesecake in the oven for another 30 minutes. To make the final layer, in a bowl, mix the other half of the sour cream with the remaining sugar and lemon juice. Mix well, till everything is well combined. Spread this mixture over the cheesecake filling as soon as you take it out of the oven. Then allow the cheesecake to cool completely at room temperature, before popping it out of the cake tin. 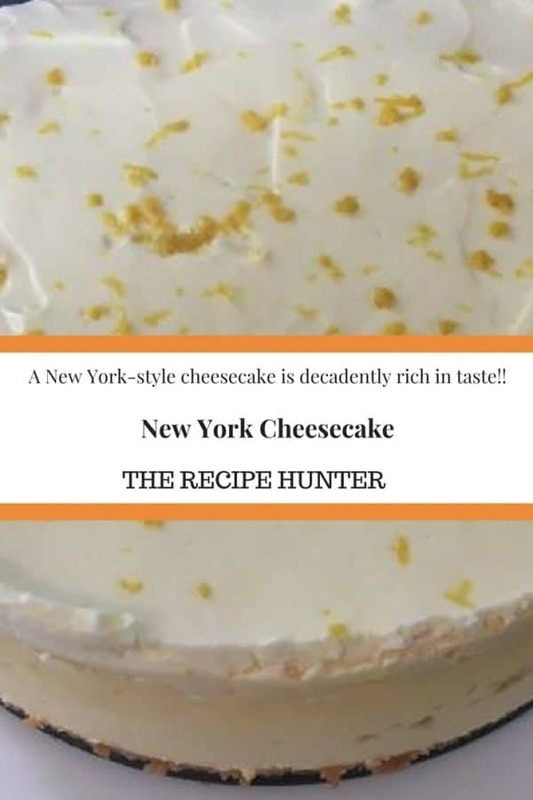 Chill the cheesecake in the fridge overnight before slicing and serving. Hi Sir – Thanks for all the shares, I do appreciate it a lot.